"Mighty" and "Yaris" (especially "Yaris Sedan") might sound like a self-contradiction to you. 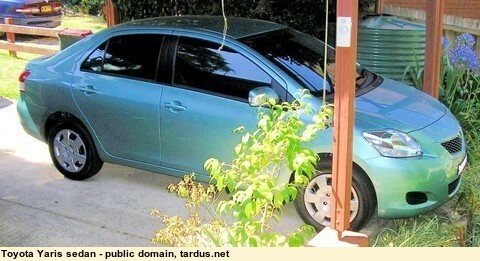 Here is Australia I suspect it is seen as a granny car, a lack-lustre sideshow to the ever popular Yaris hatch. There are few options for it, nothing very exciting, and Toyota rarely bring out updated models. What is so mighty about that? a big boot - her motto is "you can't have too big a boot!" and the Yaris sedan's boot is huge. Nearly as big as the "full-size" Camry, bigger than the Corolla's boot. seats that work for her. Because of a long standing leg problem she easily gets leg cramps. She only got about 300 metres into a road test of a Nissan Tiida sedan before that car's high-front cushion roll started a cramp. Sorry Mr Nissan dealer. The Yaris seats have proven excellent. I retired in 2010, and the Yaris became our only car. my motto - "the most important thing a car can have is reliability". We have 6 years and 70,000 kilometres (mostly short trips) on it now. In that time it has never stopped, never failed to start, and had no significant issues at all (there was a slight click in the steering a year or two into its life; Toyota replaced the steering motor under warranty without any fuss). It is still on its first set of brake-pads and just into its first set of replacement tyres. it is a great town car. Nimble and easy to park. Very good acceleration to blend in to heavy traffic. it is a great country car - we have driven it on four interstate trips now, each about 2000 km there and back. Fully laden (boot full, rear seats folded and full to above the window sills, and a 250 litre luggage pod on the roof) it cruises quietly all day at 110km/hr. We have had an after-market cruise-control fitted for the long trips (Toyota do not offer cruise control as an option, at least not here in Australia). The cruise control helps a lot with holding a good speed comfortably. Not perfect, as the engine, in common with most smaller cars, develops its maximum torque at a fairly high engine speed. This means it does hunt around a bit on hilly stretches; 110km/hr can become 115 downhill and 105 up the next, but not often. Mostly it does a good job. 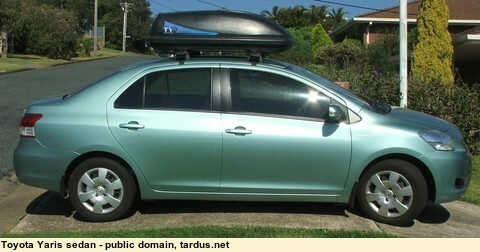 it is economical - we get 7 litres per 100 km touring fully laden with the pod on top. That's 40 mpg (Imperial gallons) or 32 mpg (US gallons). it is comfortable - no sore tails from the front seats, even on long trips. it rides well; smooth without the choppiness that some small cars have. it still looks good and not dated. The smooth aero shape is much nicer than the comical Echo sedan. Yaris sedan in "touring mode"
Surely you must have some complaints? well, yes; I have never quite got used to the central instrument pod. I would prefer the speedometer in front of the driver. oh, and I had to replace the battery after 5 and a half years! What is the world coming to?